This time we were going to teach them lesson 2 colors, loop raw motor, and sound and then incorporate it into a triangle. For the first group, everything was slow but in the second group, we did it very fast. We also had to teach them lesson 3 which was making a triangle revolving around itself. for group 1 we had to rush it because we did not have much time because it was slow for the lesson 2. but for group 2 we had more time and we didn’t have to rush it. I thought it was easier the second time around because we were more used to the lesson 2/3. 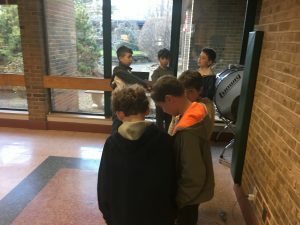 Today on March 8th we had our first sphero classes we did for 1 hour. 30 minutes for Mrs. Boyer and 30 minutes for Mrs. Cooper. First, we had Mrs. Cooper, In that group, we had William, Bora, and Zach. We were teaching them how to make an equilateral triangle. We finished early so we started playing around. Then Mrs. Boyers class In that class we had Rush, Eliot, and Skyler, but Skyler switched groups so we got Ronald instead. We taught them the same things and we finished early again. Then we were Done with our first sphero class.